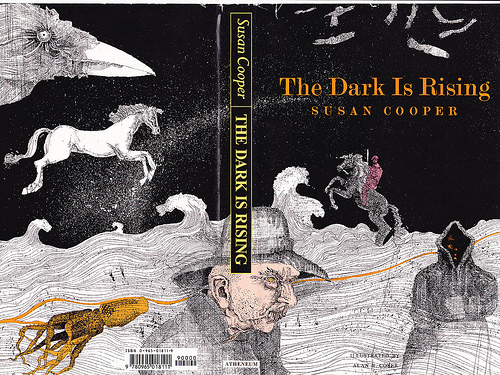 H'well, here we are with book #22 on the Top 100 Children's Novels list: The Dark is Rising, by Susan Cooper. I mentioned before that this is book 2 of The Dark is Rising Sequence, which seems misleading since the title is the same as the series (sequence) title. I wonder how many people have skipped Over Sea, Under Stone all together simply because they didn't know it exists? Which... I'm really glad I didn't because helloooo, my own particular brand of Reading OCD (wherein I have to start with Volume 1 of any series even if Volume 1 is irrefutably bad - this also extends to TV). This is a not-at-all-rare form of what we in our office call FOMO Syndrome. SO! The book! Once nice thing about this - the second book in the series asImayormaynothavementioned - is that the plot doesn't give away ANY of what's discussed in the first book. Which... is a round-a-bout way of saying that the two books are only loosely connected. King Arthur stories are tough because so often authors assume that we already know the story, which we all sort-of do (some of us more than others because of the musical Camelot and Disney's The Sword in the Stone. Some of us also may have infuriated their mothers when they were teenagers by calling her "Mad Madam Mom," and some of us should probably feel guilty that the moniker still makes us giggle uncontrollably at our advanced age). My real problem with this book stems from something Alice pointed out: that the Dark can do things like... startle you at the top of the stairs so you fall down and break your leg, but it can't harm you directly. Which leads to roughly zero drama or tension. And while zero drama or tension is what I strive for in my life outside the pages of a book (AHHHAHHAHA my family is huge, Spanish, and certifiably crazy, so good luck with that), within the pages of a book I definitely like a little stress. So I can see why this is a classic, but I did not dig it very much.